The best advice Seattle-based poet and educator J Mase III has ever gotten came from a conservative Christian woman in his hometown of Philadelphia who called him the night before his first professional poetry gig when he was 19. She wanted to hear the poems he was planning to perform. The next day, the woman and her fellow event organizers cut Mase’s set down from 20 minutes to 10, attempted to physically cleanse Mase’s spirit with holy water, and issued another warning for Mase to be careful because there were children in the audience. 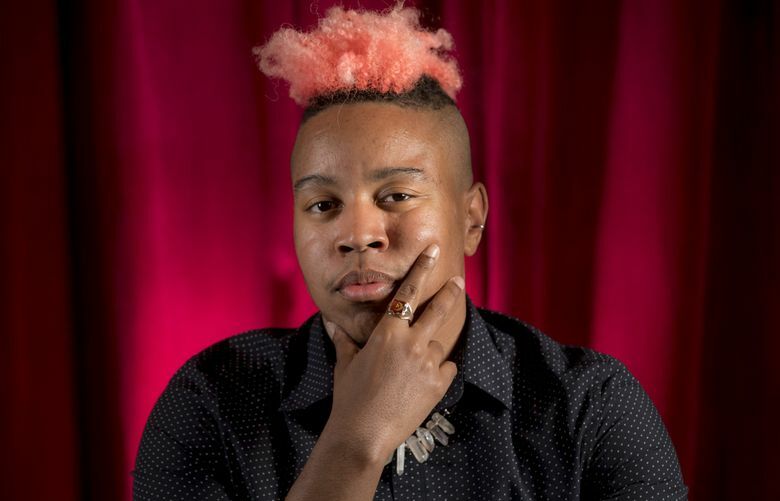 Despite the censorious intention of the original warning, Mase artfully spun the admonishment into wisdom that now guides his work as a black, trans, queer poet and educator. Today, Mase makes his living by crafting loud and proud poetry on everything from white supremacy and LGBTQ rights to personal grief and growing up in an interfaith home. He hasn’t forsaken faith communities either. He teaches workshops on LGBTQIA+ rights and racial justice at schools, universities and in faith communities across the U.S., and his current work-in-progress is the “Black Trans Prayer Book,” an interfaith book of prayers centering on the spiritual stories of black trans artists and theologians. Throughout his career, Mase, now 34, has frequently worked with faith groups and often encountered pushback. He cited incidents where people have tried to fight him or arrest him or hold prayer circles for him while working with faith groups. “Sometimes people think because I’m a trans person that I’m also somehow afraid of religion. Let me tell you something, you can try me on your Scripture. I guarantee you, because I didn’t learn this on some seminary, I learned this for survival so you can quiz me if you want, but you’re gonna go home embarrassed, cause I’m gonna do this in front of your friends,” said Mase. Lady Dane Figueroa Edidi, a performance artist, author and frequent co-collaborator, said this fearlessness is what drew her to Mase’s artwork. Edidi, who was a first reader for the book, said it helped her feel permission to mourn. The smiling photo of Mase that graces the book’s cover seems like a sharp contrast to the title and subject matter. But even in person, Mase exudes a persistent welcome and warmth that comes from his thoughtful engagement in conversation and a casual charm that easily breaks into hearty laughter. As our conversation turned to his experience after the death of his father, a man he described as “my best friend as an adult,” Mase’s smile faded and the engaged eye contact he usually held seemed to turn inward. “And Then I Got Fired” was born out of the bad advice Mase said he received when he was struggling with this grief. Like with the warning-turned-wisdom of his poetic naissance, Mase characteristically turned this bad advice into a book of blessings and poems that unabashedly address the messier parts of grief. “Sometimes the basic act of someone telling us that what you’re feeling is normal can be the difference between feeling like I have nothing left to give or my life is meaningless to —” he cuts himself short and pauses as a smile eases back onto to his face. “I don’t like the word ‘hope,’ ” he says. Unwilling to wait “for someone else to affirm that [his] message is important,” or take a chance with institutions that are not “trans competent,” Mase promotes his own art. He self-published his book and largely oversees his own marketing and publicity efforts. In his workshops, he guides fellow queer and trans artists through an examination of their needs — financial, artistic, medical and otherwise — to create actionable plans to move toward sustaining themselves solely by their art. At 11 p.m. on a Monday, after a full day that included a photo shoot, leading a three-hour workshop and the interview for this story, Mase reflected on the past six years that he’s spent fending for himself as a full-time artist. Success is “being able to not have to worry about the people that don’t understand my experience being in control of my life,” he said.